An Act to provide for the conservation of endangered and threatened species of fish, wildlife, and plants, and for other purposes. 16 U.S.C. ch. 35 § 1531 et seq. 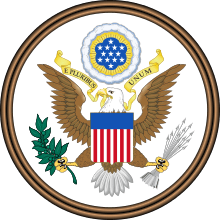 The Endangered Species Act of 1973 (ESA; 16 U.S.C. § 1531 et seq.) is one of the few dozens of US environmental laws passed in the 1970s, and serves as the enacting legislation to carry out the provisions outlined in The Convention on International Trade in Endangered Species of Wild Fauna and Flora (CITES). Designed to protect critically imperiled species from extinction as a "consequence of economic growth and development untempered by adequate concern and conservation", the ESA was signed into law by President Richard Nixon on December 28, 1973. The U.S. Supreme Court found that "the plain intent of Congress in enacting" the ESA "was to halt and reverse the trend toward species extinction, whatever the cost." The Act is administered by two federal agencies, the United States Fish and Wildlife Service (FWS) and the National Oceanic and Atmospheric Administration (NOAA). The near-extinction of the bison and the disappearance of the passenger pigeon helped drive the call for wildlife conservation starting in the 1900s. Ornithologist George Bird Grinnell wrote articles on the subject in the magazine Forest and Stream, while Joel Asaph Allen, founder of the American Ornithologists' Union, hammered away in the popular press. The public was introduced to a new concept: extinction. A species can be listed in two ways. The United States Fish and Wildlife Service (FWS) or NOAA Fisheries (also called the National Marine Fisheries Service) can directly list a species through its candidate assessment program, or an individual or organizational petition may request that the FWS or NMFS list a species. A "species" under the act can be a true taxonomic species, a subspecies, or in the case of vertebrates, a "distinct population segment." The procedures are the same for both types except with the person/organization petition, there is a 90-day screening period. 1. If a petition presents information that the species may be imperiled, a screening period of 90 days begins (interested persons and/or organization petitions only). If the petition does not present substantial information to support listing, it is denied. The annual rate of listing (i.e., classifying species as "threatened" or "endangered") increased steadily from the Ford administration (47 listings, 15 per year) through Carter (126 listings, 32 per year), Reagan (255 listings, 32 per year), George H. W. Bush (231 listings, 58 per year), and Clinton (521 listings, 65 per year) before decline to its lowest rate under George W. Bush (60 listings, 8 per year as of 5/24/08). The rate of listing is strongly correlated with citizen involvement and mandatory timelines: as agency discretion decreases and citizen involvement increases (i.e. filing of petitions and lawsuits) the rate of listing increases. Citizen involvement has been shown to identify species not moving through the process efficiently, and identify more imperiled species. The longer species are listed, the more likely they are to be classified as recovering by the FWS. As habitat loss is the primary threat to most imperiled species, the Endangered Species Act of 1973 allowed the Fish and Wildlife Service (FWS) and National Marine Fisheries Service (NMFS) to designate specific areas as protected "critical habitat" zones. In 1978, Congress amended the law to make critical habitat designation a mandatory requirement for all threatened and endangered species. The court found that three members had been in illegal ex parte contact with the then-President George H.W. Bush, a violation of the Administrative Procedures Act. 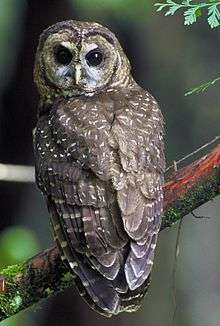 The committee's exemption was for the Bureau of Land Management's timber sale and "incidental takes" of the endangered northern spotted owl in Oregon. ↑ U.S. Fish and Wildlife Service. "International Affairs: CITES" Retrieved on 25 June 2015. ↑ "Tennessee Valley Authority v. Hill", 437 U.S. 153 (1978) Retrieved 24 November 2015. 1 2 3 4 5 6 "ENDANGERED SPECIES ACT OF 1973" (PDF). U.S. Senate Committee on Environment & Public Works. Retrieved 25 December 2012. ↑ "Endangered Species Program - Species Status Codes". U.S. Fish and Wildlife Service. Retrieved 25 December 2012. ↑ "Electronic Code of Federal Regulations, Title 50: Wildlife and Fisheries". U.S. Government Printing Office. Retrieved 25 December 2012. ↑ Weidensaul, Scott (2006). Of A Feather. Houghton Mifflin Harcourt. pp. 135–6. ISBN 0-15-101247-4. ↑ Roman, Joe (2011). Listed: Dispatches from America's Endangered Species Act. Harvard University Press. p. 61. ISBN 978-0-674-04751-8. ↑ AP (March 12, 1967). "78 Species Listed Near Extinction; Udall Issues Inventory With Appeal to Save Them". New York Times. ↑ Wilcove, David S.; Margaret McMillan (2006). "Class of '67". In Dale Goble; J. Micharl Scott; Frank W. Davis. The Endangered Species Act at Thirty. 1. Island Press. p. 48. ↑ Chadwick, Douglas; Joel Sartore (1996). The Company We Keep. National Geographic Society. pp. 19–21. ISBN 0-7922-3310-7. ↑ Nixon. R (1972). "Special Message to the Congress Outlining the 1972 Environmental Program". 51. ↑ Levine, Marianne. "House approves changes to Endangered Species Act despite veto threat". www.latimes.com. The Los Angeles Times. Retrieved 2 August 2014. ↑ "Notice". Endangered and Threatened Wildlife; Final Listing Priority Guidance for FY 2000. Federal Register. pp. 27114–19. Retrieved 2009-07-03. 1 2 3 4 5 Greenwald, Noah; K. Suckling; M. Taylor (2006). "Factors affecting the rate and taxonomy of species listings under the U.S. Endangered Species Act". In D. D. Goble; J.M. Scott; F.W. Davis. The Endangered Species Act at 30: Vol. 1: Renewing the Conservation Promise. Washington, D.C.: Island Press. pp. 50–67. ↑ Puckett, Emily E.; Kesler, Dylan C.; Greenwald, D. Noah (2016). "Taxa, petitioning agency, and lawsuits affect time spent awaiting listing under the US Endangered Species Act". Biological Conservation. 201: 220–229. doi:10.1016/j.biocon.2016.07.005. ↑ Brosi, Berry J.; Biber, Eric G. N. (2012). "Citizen Involvement in the U.S. Endangered Species Act". Science. 337 (6096): 802–803. doi:10.1126/science.1220660. 1 2 Taylor, M. T.; K. S. Suckling & R. R. Rachlinski (2005). "The effectiveness of the Endangered Species Act: A quantitative analysis". BioScience. 55 (4): 360–367. doi:10.1641/0006-3568(2005)055[0360:TEOTES]2.0.CO;2. ISSN 0006-3568. 1 2 Suckling, Kieran; M. Taylor (2006). "Critical Habitat Recovery". In D.D. Goble; J.M. Scott; F.W. Davis. The Endangered Species Act at 30: Vol. 1: Renewing the Conservation Promise. Washington, D.C.: Island Press. p. 77. ↑ The ESA does allow FWS and NMFS to forgo a recovery plan by declaring it will not benefit the species, but this provision has rarely been invoked. It was most famously used to deny a recovery plan to the northern spotted owl in 1991, but in 2006 the FWS changed course and announced it would complete a plan for the species. 1 2 "Portland Audubon Society v. Endangered Species Committee". Justia. Retrieved 2009-08-26. ↑ Shirey, P.D. and G.A. Lamberti (2010) Assisted colonization under the U.S. Endangered Species Act. Conservation Letters 3(1): 45–52. ↑ USFWS "Delisting a Species" accessed August 25, 2009 Archived March 26, 2010, at the Wayback Machine. ↑ U.S. Fish and Wildlife Service Summary of Listed Species. ↑ Brown, Gardner M. Jr., and Jason F. Shogren. 1998. Economics of the Endangered Species Act. Journal of Economic Perspectives 12(3):3–20. ↑ Green & The Center for Public Integrity 1999, pp. 115 & 120. ↑ Green & The Center for Public Integrity 1999, p. 120. ↑ Green & The Center for Public Integrity 1999, pp. 113–115. ↑ Green & The Center for Public Integrity 1999, p. 117. ↑ Archived April 6, 2010, at the Wayback Machine. Corn, M. Lynne and Alexandra M. Wyatt. The Endangered Species Act: A Primer. Congressional Research Service 2016. The Endangered Species Act at Thirty Dale Goble, J. Michael Scott (editors) Island Press 2006. Green, Alan; The Center for Public Integrity (1999). Animal Underworld: Inside America's Black Market for Rare and Exotic Species. Public Affairs. ISBN 1-58648-374-9. Stanford Environmental Law Society, The Endangered Species Act Stanford University Press 2001 ISBN 0-8047-3842-4.